Loneliness produces psychological (and physical) responses that affect behaviour and wellbeing. The primary purpose of loneliness is to motivate us to get connected. However, there are side effects of loneliness that affect our psychology. As one would expect, since loneliness is an aversive signal, it makes us feel unhappy. Further, because loneliness triggers when our social environment appears unsafe, it is associated with us feeling unsafe. However, unexpected psychological effects arise from loneliness making us hypervigilant for social threats (for more information, see biology of loneliness). In today’s modern environment, these psychological effects can spiral some individuals into chronic loneliness. 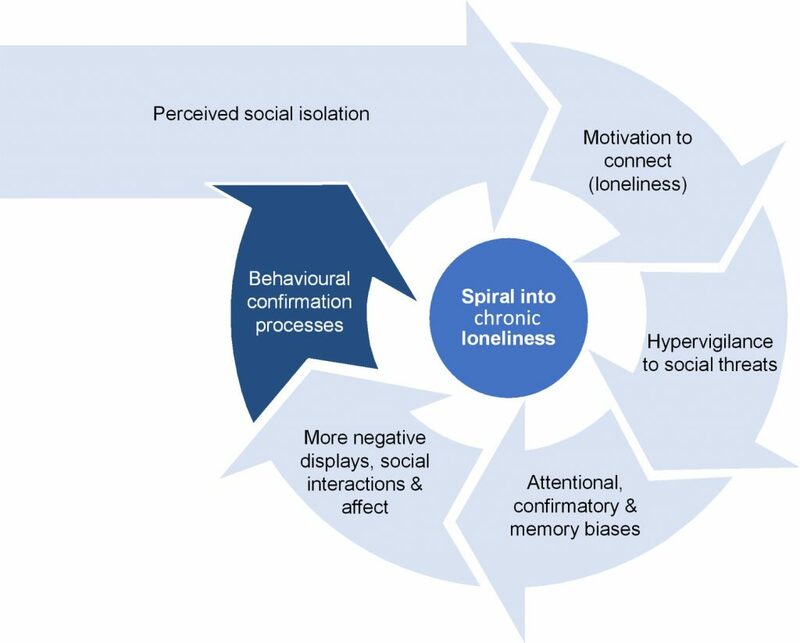 When there is perceived social isolation, an individual feels lonely which motivates them to connect. A core aspect of the motivation to connect is the hypervigilance for social threats, which may begin with withdrawal from initial social interaction (Qualter et al. 2015). The impact of these biases, affects, and processes can be to make the individual more socially isolated – which then repeats and deepens the cycle. Chronic loneliness can also be caused when individuals are cut-off from access to social networks. This is common in the disabled, seniors 75+, and those working and residing away from social networks. Lonely individuals are lower in trust for others (Rotenberg 2010). The hypervigilance for social threats makes an individual more sensitive to social cues, which can produce a confirmatory bias toward seeing social dangers. This, in turn, can create negative memory biases for social information. For example, for lonely individuals, their memory of interactions with others grows more negative with time (e.g. Duck et al. 1994). Social interactions of lonely individuals (vs. non-lonely individuals) are more negative and less satisfying, leading to more negative moods and interactions (Hawkley et al. 2007). With a perception of social danger, there is a greater likelihood of lonely individuals promoting hostile or antagonistic behaviour to push away the very people they most wish to connect with (Downey et al. 2005; Murray et al. 2003; Rotenberg 1994). Once people in a lonely person’s social circle form a negative impression (e.g. by the lonely person pushing them away), their behaviours towards the lonely person are likely to reinforce the lonely person’s negative social expectations (Rotenberg et al. 2002). “Consequently, although lonely individuals may view themselves to be passive victims in their social world, they are actually active contributors through their self-protective interactions with others” (Cacioppo et al. 2005). To explore other sciences of loneliness, please click the coloured box of interest. Cacioppo, John & Louise Hawkley (2005): “People thinking about people: The vicious cycle of being a social outcast in one’s own mind,” in K. Williams, J. Forgas, & W. von Hippel (eds. ), The social outcast: Ostracism, social exclusion, rejection, and bullying (pp. 91–108). New York, NY: Psychology Press. Cacioppo, John, Stephanie Cacioppo aand Dorret Boomsma (2014) “Evolutionary mechanisms for loneliness”, Cognition & Emotion, vol. 28(1), p. 3-21. Downey, G. & R. Romero-Canyas (2005): “Rejection sensitivity as a predictor of affective and behavioural responses to interpersonal stress: A defensive motivational system”, In K. Williams, J. Forgas, & W. von Hippel (eds. ), The social outcast: Ostracism, social exclusion, rejection. Duck, S., K. Pond, & G. Leatham, G. (1994): “Loneliness and the evaluation of relational events”, Journal of Social and Personal Relationships, vol. 11(2), p. 253–276. Hawkley, Louise, K. Preacher, & John Cacioppo (2007): “Multilevel modeling of social interactions and mood in lonely and socially connected individuals: The MacArthur social neuroscience studies,” in A. Ong & M. van Dulmen (eds. ), Oxford handbook of methods in positive psychology (pp. 559– 575). New York, NY: Oxford University Press. Murray, S., G. Bellavia, P. Rose, & D. Griffin (2003): “Once hurt, twice hurtful: How perceived regard regulates daily marital interactions”, Journal of Personality and Social Psychology, vol. 84(1), p. 126–147. Qualter, Pamela, Janne Vanhalst, Rebecca Harris, Eeske Van Roekel, Gerine Lodder, Munirah Bangee, Marlies Maes, and Maaike Verhagen (2015): “Loneliness across the life span”, Perspectives on Psychological Science, vol. 10(2), p. 250–264. Rotenberg, K. (1994): “Loneliness and interpersonal trust”, Journal of Social and Clinical Psychology, vol. 13(2), p. 152–173. Rotenberg K., J. Gruman, & M. Ariganello (2002): “Behavioral confirmation of the loneliness stereotype”, Basic & Applied Social Psychology, vol. 24(2), p. 81–89. Rotenberg, K. (2010): “The conceptualization of interpersonal trust: A basis, domain, and target framework”, in K. Rotenberg (ed. ), Interpersonal trust during childhood and adolescence (pp. 8–27). New York, NY: Cambridge University Press.